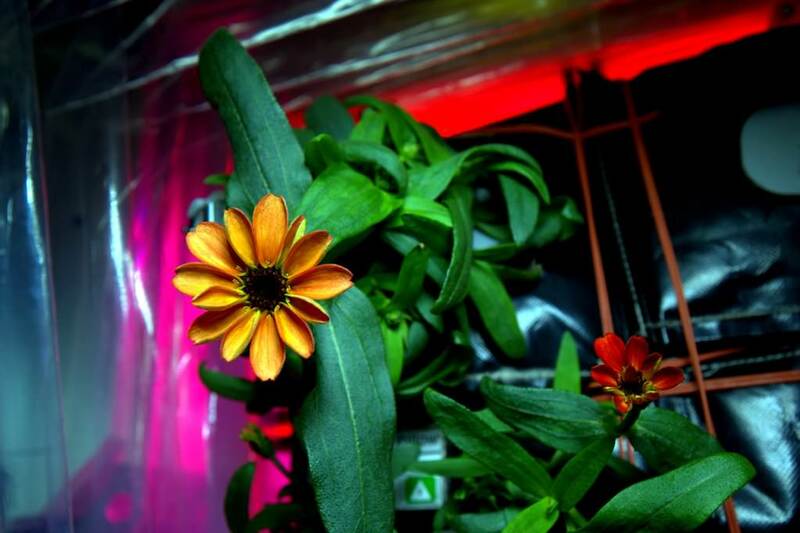 The first Zinnia flower to bloom in space is dramatically catching the sun’s rays like we have never seen before – through the windows of the Cupola on the International Space Station (ISS) while simultaneously providing a splash of soothing color, nature and reminders of home to the multinational crew living and working on the orbital science laboratory. Furthermore its contributing invaluable experience to scientists and astronauts on learning how to grow plants and food in microgravity during future deep space human expeditions planned for NASA’s “Journey to Mars” initiative. NASA astronaut and Expedition 46 Commander Scott Kelly is proudly sharing stunning new photos showing off his space grown Zinnias – which bloomed for the first time on Jan. 16, all thanks to his experienced green thumb. The most breathtaking view, seen above, shows the newly blooming Zinnia soaking up sunlight inside the seven windowed Cupola – backdropped by our beautiful Earth and one of the stations huge power generating solar arrays. The domed Cupola is the astronauts favorite place on station. “Yes, there are other life forms in space!” Kelly tweeted in glee over the weekend with a magnificent series of photos of the fruits of his space gardening labor. “How does your garden grow? Here’s how my #spaceflower came to bloom,” Kelly noted. So the six humans currently aboard the ISS are now sharing the orbiting outpost with the experimental Zinnias being grown in the stations Veggie plant growth facility. Whereas the Zinnia plants are normally bathed with red, green and blue LED lighting in the chamber, Kelly decided to further nurture the plants with some all natural sunlight from our life giving sun. The Veggie experiment is comprised of “pillows” holding the Zinnia flower seedlings that provide nutrients to the plants root system inside the experimental and low-cost illuminated growth chamber. Kelly is clearly relishing his new role as “Veggie commander” of the now thriving Zinnias by following in the fictional footsteps of botanist Mark Watney in “The Martian” and deciding on his own how best to care for the plants. But it almost wasn’t to be. Only a few weeks ago, these same Zinnias were suffering from a serious case of space blight when he discovered traces of mold just before Christmas – as reported here. “Our plants aren’t looking too good. Would be a problem on Mars,” tweeted Kelly. So Kelly set about to save the Zinnias from a potential near death experience. The survival of the Zinnias is a direct result of Kelly requesting permission to take personal change of caring for the plants without having to constantly ask Mission Control for pages and pages of detailed instructions and direction. The Veggie science team created and gave Kelly a “simple one-page care guide as a streamlined resource” dubbed “The Zinnia Care Guide for the On-Orbit Gardener,” said NASA officials. The Zinnias have been on the rebound ever since and the proof is in the blooming. “Some of my space flowers are on the rebound!” Kelly tweeted in an ISS Weekend Update to space enthusiasts and horticulturalists worldwide. 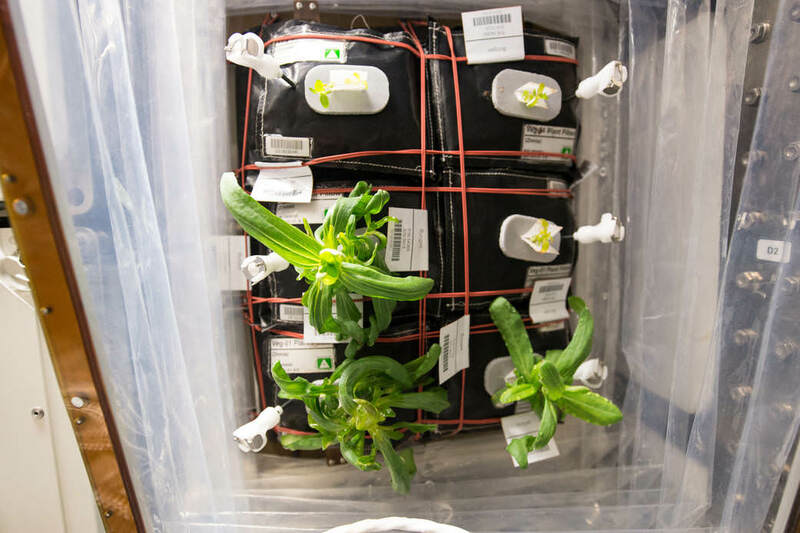 The Zinnia flowering experiment was initially started on Nov. 16, 2015 when NASA astronaut Kjell Lindgren activated Veggie’s rooting “pillows” containing zinnia seeds. Kelly is now on the final leg of his historic “1Year ISS Mission” aboard the outpost and conducting hundreds of experiments aimed at paving the way for multi-year expeditions to the Red Planet. In 2015, the ISS crew had already proven they could successfully grow, cultivate and eat space grown romaine lettuce which they gleefully harvested from Veggie – as I reported here. “It was one small bite for man, one giant leap for #NASAVEGGIE and our #JourneytoMars. #YearInSpace,” tweeted Kelly back in August 2015. Besides bringing some much needed sensory stimulation to the space station crew there is another serious purpose behind growing food and flowers with Veggie. Learning how to grow edible food in microgravity is a key task that future astronauts will have to master to enable voyages to the Red Planet and back. The progress of the plants cultivated in the stations Veggie growth chamber will be compared to those grown on Earth as “ground truth” counterparts. The “Veggie” plant growth system is housed inside the European Space Agency’s Columbus laboratory located at the end of the US section of the ISS. Veggie-01 was delivered to the ISS by the SpaceX-3 Dragon cargo resupply mission launched in April 2014, carrying the pillow sets containing the romaine lettuce and zinnia seeds. The experiment reminds me of the classic science fiction movie “Silent Running” starring Bruce Dern striving to save plants growing on a future space freighter. And speaking of the sun, here’s “A little sunrise to brighten your BlueMonday !” Kelly tweeted on Jan. 18, 2016. I hope not. Does not end well. Does anyone know of near term plans? Manually pollinate, harvest seeds and go for gen 2? I wonder if we will eventually find that vegetables DO require gravity to fully mature/grow? NASA at one point planned on including a CAM – Centrifuge Activity Module – built by Bigelow Aerospace, on the ISS but that project was dropped by the Bush admin. The prototype module now languishes unused in a Japanese car park and probably will never be flown with nothing big enough to launch it? like a shuttle? It’s just too bad and a crying shame that module wasn’t flown because we definitely need something like that to get a strong manned mission to Mars and back. My hope is that new funding will be found to launch that or a similar module? Previous PostPrevious What Is The Plum Pudding Atomic Model?